The seed from a Golden delicious apple tree will produce an apple tree, but it will not produce a Golden Delicious apple tree. Likewise, the seed from Pear will not produce a Pear tree. Grafting is a horticultural technique whereby tissues from one plant are inserted into those of another so that the two sets of vascular tissues may join together. Refrigerator for root stock or it can be put buried at cold place. The Bench Grafting is used mostly on young apple 2 -3 years, pear and cherry trees when the branches are relatively small (not more than 1/4 to 3/8 inch in diameter) and the under stock is about the same diameter as the shoots of the new plant in apple nursery. Cut—Cut off the above part of the under stock, leaving a stub at least a ½ foot long above the ground. Make a straight, slanting cut about 1½ inch long fountain pen nib on both the scion and the stock (see A & C in drawing 1.). Make the cut straight smooth with good grafting knife with—one stroke will be best. Make a straight draw cut (not split), beginning near the top and cutting about the full length of the level (B & D). Drawing 1. The Bench Grafting is usually used for grafting root stocks and Shoots but can also be used for grafting small branches. Join—Match the two parts together (E). Unless the scion and stock are the same size, be sure the scion is in contact with the inner bark on one side. If the toe of either the stock or scion extends beyond the heel of the other, cut if off evenly. Tying and covering—bind tightly with tape, then carefully cover the Joined parts and binding material with grafting compound. This type of graft is difficult for the beginner but is used extensively by experienced operators. It lends itself to the tape method of binding. Tape serves to seal the wound and bind the parts together. Care after graft—Remove wrapping as soon as the scion has started to grow (you can check this, when leafs starts coming out of the bud. The cleft graft is used for top working older established apple, pear and cherry trees, either on the trunk of a small tree or on the side branches of a larger tree. It is best adapted to branches 1 to 2 inches in diameter. The grafts are made within 2 to 3 feet of the trunk or main branches and preferably not more than 4 to 6 feet from ground, or new top of tree. Cut—Select a place free from knots and cut off the stock with a saw. Cut the cleft (avoid splitting if possible) with a grafting knife. In horizontal branches, the cleft should be sidewise. 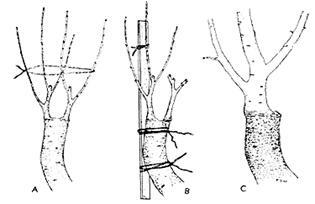 Sloping cut about ¼ inch above the upper bud, cut the Shoots to include three buds, and to a blunt wedge about 1½ inches in length with one side slightly thicker than the other (see A & B in Drawing 2).If the scion wedge is cut to a sharp point there is danger of the bark peeling. Also a sharp scion wedge’ will not fit the cleft as well (C). Drawing 2. 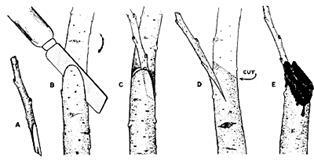 The cleft graft is the one to use on large branches. Join—Open the cleft slightly with a grafting knife. Insert a scion on each side, with the inner bark of stock and scion in contact. Have the thick side of the scion outward (B). See that the bark of the larger stock is thicker than the scion bark, so the scion should not be flush with the stock. A very slight tilt will assure a contact, at least where the cambium layers cross (D). Tying and covering—Cover the Joins with grafting compound and be sure the cleft is covered its full length (E). Care after graft—Shoots that are growing vigorously will need attention to prevent breakage. Either tie the scion to a supporting brace (see B in Drawing 3) or pinch back the tips before growth becomes excessive. For additional support, circle all the shoots from one stub with twine (A). Drawing. 3. 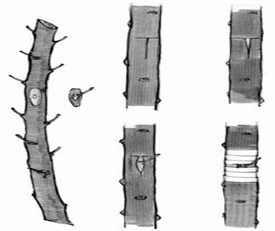 In this example of a cleft graft, three stages in the growth of a branch from a scion are shown. Matured trees are generally poor subjects for cleft grafting, so when grafting their large branches, a slightly different method is ordinarily used. Carefully saw off the branch undercutting it first to avoid tearing the bark. You may need to re cut the stub to get it smooth. Saw the branch to receive the Shoots, instead of splitting it. Make two saw cuts about 3 inches deep at 90 degree angles to each other across the end of the stub, making a + shape. Then fit the Shoots into the four places made by these cuts. Side graft is mostly done on a wide range of branch sizes (¼ to ¾ inch diameter), its use is generally restricted to branches that are too large for the Bench Grafting yet not large enough for the cleft graft. Cut—Select a smooth place on the under stock branch at least a foot from the trunk. Make a slanting cut at a narrow angle almost to the pith (core of the branch) (see B in Drawing 5). Cut the scion to a short, sharp wedge (about 1 inch) with one side thicker than the other (see A). Drawing 5. In the side graft, the cut goes across the grain to reduce splitting. Join—Bend the branch slightly to open the cut. Press the scion in so the cambium layers of the stock and scion meet at one side (C). Tying and covering—Tying is unnecessary if the stock binds well, but you may have to tie small materials if the scion is not held firmly. Cut surfaces should then be covered with grafting compound (E). Care after graft—in about two weeks, cut off the stock above the Join (D) using sharp shears in order to avoid disturbing the scion. Then cover the cut surface with grafting compound (D). Inspect grafts during the growing season to guard against faulty covering or binding. It is done in the month of 15th March to 15th April, when the bark of the stock slips easily and when there are well-grown buds. The first step is to cut bud sticks of the desired cultivar from strong shoots of the present season’s growth (see A in Drawing 6). These buds should be mature, as indicated by a slightly brownish color. Drawing 6. In Chip Budding, a single bud does the work of a scion. Clip off the leaves as soon as the bud sticks are cut, leaving about ½ inch of the leafstalk for a handle. Discard the soft tips of the bud sticks. Wrap the bud sticks in moist burlap, moss or paper to prevent drying out. Branches from the size of a lead pencil up to ½-inch diameter may be worked by this method. The bark of larger branches is too thick for satisfactory Chip Budding. 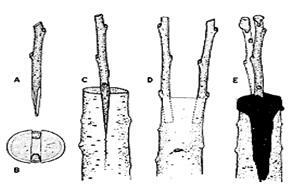 Cut—on the branches of the stock, about 15 inches or more from the trunk, make a T cut just across the bark (C). Then, with a knife blade or bark separator, lift the corners and carefully loosen the bark. Cut a bud from bud stick (A) which includes a thin piece of attached wood (B). Start the bud under the flaps of bark and lead it down by the handle (see D and E in Drawing 6). Tying—Use rubber strips, electrician’s tape, or adhesive tape to tie the bud. Wrap and tie tightly, but be sure you do not cover the bud (see F in Drawing 6). Care after graft—Cut the tie before it binds too tightly—that is, in two or three weeks. Cut on the side away from the bud. Rubber strips need not be cut. The bud should remain dormant until the following spring. Cut off the stock above the bud as soon as the bud starts growing. Do not permit any shoot growth. As shown in Drawing 7, cut from (A) well under the bud to B. Remove the knife and rock the blade just through the bark at B. Grasp the bark between your thumb and finger and pinch the bark with attached bud (C) free from the wood (D). If the bud stick is fresh and in good condition, you will be successful after a few tries. Drawing 7. Bud with wood removed.